Really excited to be back for another Wizjam, and using Gamemaker for the first time. Already blown away by what all of you talented people have cooking up, can't wait to play the entries! Idea: Returning from a long absence, you begin going through your share of your late grandfather's inheritance. You discover a mystery that compels you out of your small Texas town and down the road in search of answers. As you journey further from home you discover more and more strangeness. Conversations in towns lead to decisions about where to drive next. Artifacts and clues lead to new mysteries. Nothing will be resolved. Game: Kentucky Route Zero meets Aviary Attorney meets What Remains of Edith Finch. (just, y'know, smaller and probably sillier). You drive along routes in map view, stopping at towns to have conversations visual novel style, click around scenes to find clues, and check your inventory. Because I do not currently have an artist lined up I am planning on creating all the visual assets using images from the public domain. 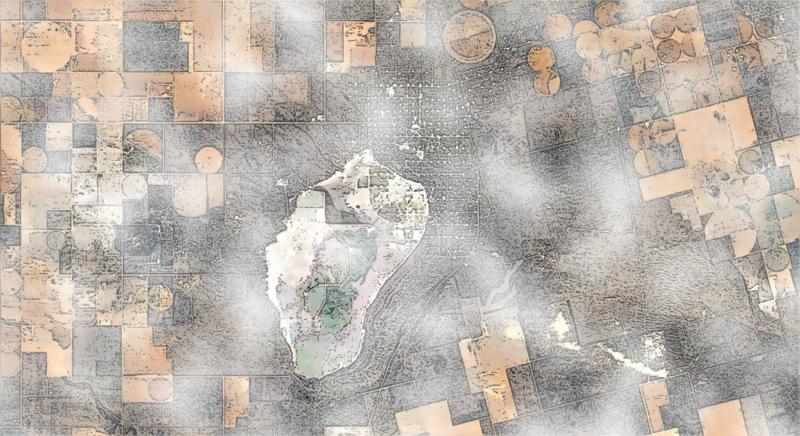 The overworld map will be drawn from Google Earth images of Texas with some editing (this is my first stab at it above). The characters in towns and the clues will be sourced from historical illustrations like the British Library's free image collection and the Smithsonian. I still need help! If anyone has any interest in getting involved I need help finding or creating main character and car sprites, and in editing the volume of images it is going to take to make this. Any help, advice, or friendly words would be deeply appreciated. Link to team building thread with contact info here. Thanks! I really like that map effect! Only got a little way into KR0, but the sense of mystery is palpable right from the go, it's a wonderful thing to aspired to! This sounds great Rilen! What're you using to make all the dialogue/interactions? I think there's a good open-source dialogue thingo floating around I can point you to for GameMaker 1.4 if that's the version you're using? Yeah this sounds cool, im really interested to see where this goes.